Readers, it’s officially all over for another year. Roasted chestnuts have been consumed, yuletide carols were sung by many choirs and folks may well have dressed up like Eskimos… but who are we to stop them? We took the decorations down today, so the house is looking rather bare, I have to say. Like previous years, I had great intentions of making baked goodies as gifts, but time just didn’t permit. AGAIN. My last post Christmas Cupcakes does show what I managed, which was a step forward from 2012. 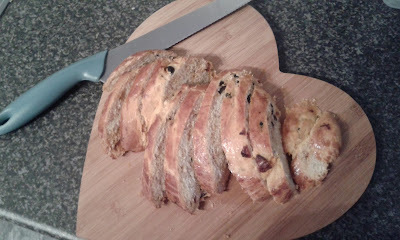 I did however, have time to make some loaves of bread for our festive dining. I am a sucker for home made bread. I can’t see past it. 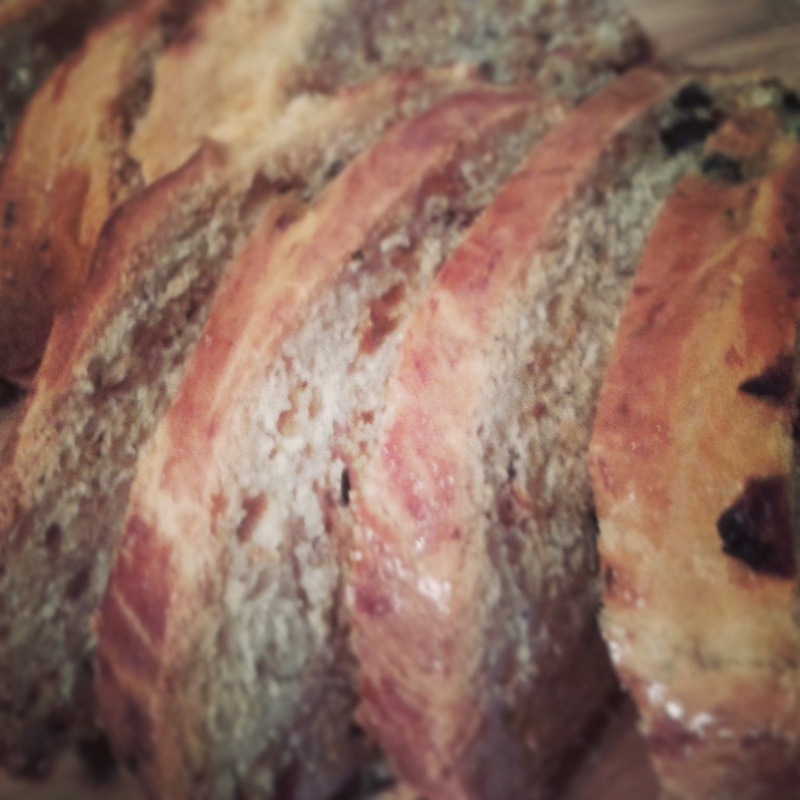 The stress relief from kneading dough, the smell of the bake… it’s my favourite. It may be carbolicious (great new word!) but at least I know my own bread isn’t packed with preservatives or any other nasties. I’ve made bread from packs before, but never from scratch. So this was a first attempt. The recipe made two loaves – the first we enjoyed on Christmas Eve with baked Camembert. The second accompanied home-made prawn cocktail for Christmas dinner with the leftovers being put out for our Boxing Day buffet. Bread making is a time consuming process, but it's well worth the effort as the end result is delicious and has such a depth of flavour, compared with mass made counterparts. This recipe came from our local paper, The Courier, who had a pull out Love Baking series in autumn 2013. I’ve made some small adaptations, to suit our tastes, which is the recipe below. Sift the flour and salt into a large bowl, then stir in yeast, sugar and thyme. Make a well in the centre of the bowl and pour in the water and olive oil. Stir to mix with a wooden spoon until dough comes together. Knead in bowl with hands until the dough leaves the sides of the bowl. Turn out onto a mat or clean worktop. Use a little olive oil on the mat and your hands, before starting to knead. 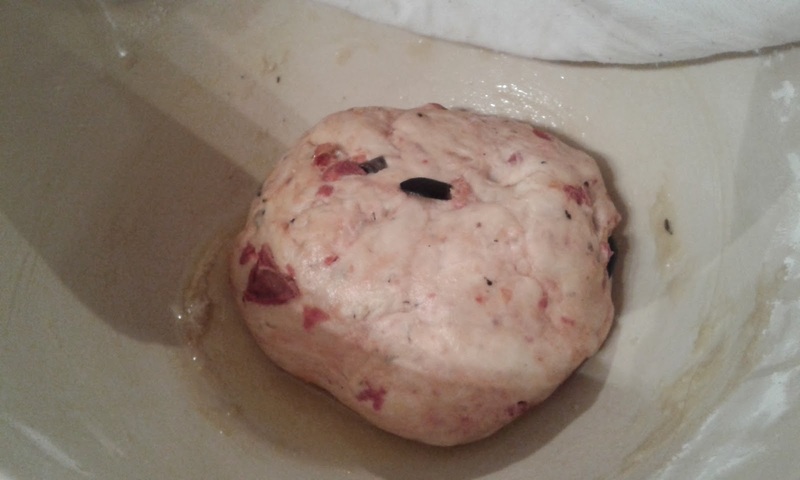 Knead in the chopped olives and sun dried tomatoes and knead for a further 5 minutes. Dough should be smooth and elastic. Brush a clean bowl with olive oil. Shape dough into a bowl. Cover the bowl with a hot damp tea towel and leave dough to rise in a warm place for around 1h 30 mins, or until the dough has doubled in size. Dust a baking sheet with flour. Remove the dough from the bowl and place onto a mat/worktop. Cut the dough in half. Using oiled hands, shape each half into an oval shape. Place on the dusted baking sheet and recover with a damp tea towel. Leave to rise for an additional 45 minutes. Preheat your oven to 200◦C/400◦F/Fan 180◦C/ Gas 6. Uncover dough and make three shallow diagonal cuts in the top of each loaf. Brush each loaf with beaten egg yolk. Place tray in preheated oven and bake for around 40 minutes until golden brown. Loaves are cooked when tapped on base with knuckles and a hollow sound is produced. Close up - a decent first attempt! These loaves don’t contain preservatives, so keep in an airtight container and eat within a couple of days. Those on a gluten free diet, could try this recipe substituting the listed ingredients for gluten free variants. Using olive oil rather than flour on your hands helps to keep the dough moist. However, if it gets too wet, just add a sprinkle of flour to your hands and mat, then keep kneading. Ideal served with baked cheeses, home-made soup or in the bread basket at a dinner party. P.S. – Here’s a great use for a round loaf, from a recent trip to Budapest. Why serve your soup in a ceramic bowl, when you can serve it from an edible one? 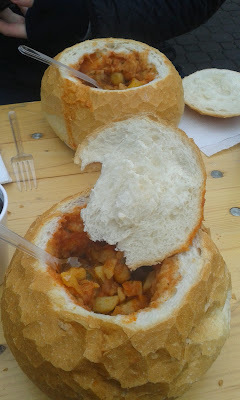 Goulash Soup was enjoyed at a festive market, where we ate the contents, then ate the lid, then ate the bowl. No waste and no pesky dishes!!! !